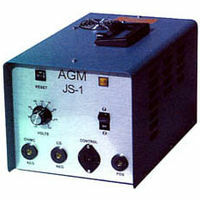 The AGM Model JS-1 Welding System is a versatile, solid state, portable pin and stud welding system designed for a variety of fastening applications. It was developed for welding 14Ga. CD pins through 1/4 – 20 CD studs, including Cup Head Pins, onto a metallic surface through the use of initial contact Capacitor Discharge (CD) welding. The welding system consists of a power pack, a lightweight weld gun, gun lead extension and ground lead, complete with a ground clamp.